Before Christopher Columbus arrived in 1492, the island that we now call Hispaniola was populated by the native Taíno people. They called their island Quisqueya (mother of all lands) and Ayiti (land of high mountains. Columbus was the one who named it Hispaniola. The island includes the territory of today's Republic of Haiti and the Dominican Republic. Before Columbus, the island's territory consisted of five chiefdoms: Marién, Maguá, Maguana, Jaragua, and Higüey. First founded in 1496, when the Spanish settled on the island, and officially from August 5th, 1498, the city of Santo Domingo became the oldest European city in the Americas. Bartholomew, brother of Christopher Columbus, founded the settlement. He named it La Nueva Isabela, after an earlier settlement in the north, which had been named after the Queen of Spain. 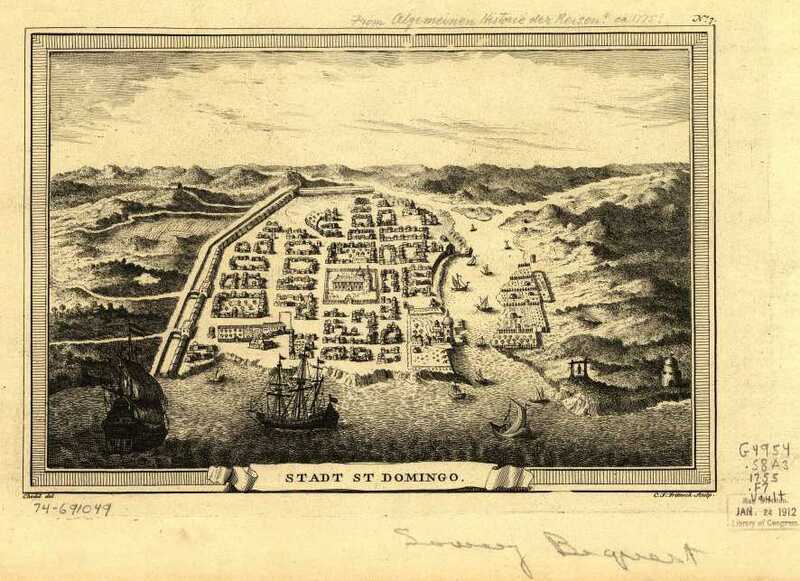 In 1495 it was renamed Santo Domingo, in honor of Saint Dominic, and it came to be known as the "Gateway to the Caribbean." 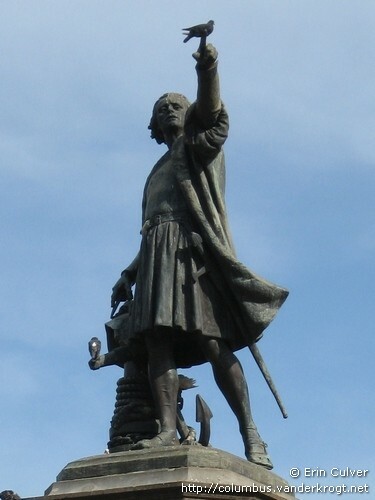 The expeditions which led to Ponce de León's colonization of Puerto Rico, to Diego Velázquez de Cuéllar's colonization of Cuba, to Hernando Cortes' conquest of Mexico, and Vasco Núñez de Balboa's sighting of the Pacific Ocean were all launched from the city of Santo Domingo. In June 1502, the city was destroyed by a major hurricane, and the new Governor, Nicolás de Ovando, had it rebuilt on a different site. The original layout of the city and a large portion of its defensive wall can still be seen today. Diego Colon arrived in 1509, and assumed the powers of admiral and Viceroy (official representative of the King.) In 1512, a court with royal appointed judges was set up. The Spaniards used this settlement as their first foothold of power in the Americas, from which they conquered other Caribbean islands and much of the South American mainland. Eventually, however, its influence began to wane as the Spaniards focused their attention more on the mainland after conquering Mexico, Peru, and other regions of Latin America. In 1586, the Englishman Francis Drake captured the city and held it for ransom. The Spanish called Drake a pirate, and the English called him a national hero. He was later knighted. Drake's invasion, part of a growing force of Buccaneer Pirates, signaled the decline of Spanish dominion over Hispaniola. Spanish policies of large plantations run by slave labor reduced the population of the island. Then, 1655 Oliver Cromwell (political and military leader of England) sent an expedition that attacked the city of Santo Domingo. It was defeated. The English troops withdrew and took the less guarded colony of Jamaica, instead. Jamaica became the toe-hold that England had wanted in the Caribbean. 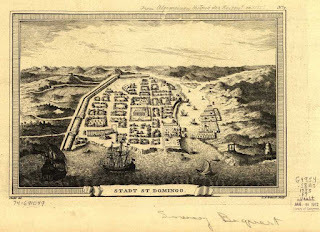 Lacking enough naval force in the New World to defend their new possession, the English governor opened Jamaica’s capital city, Port Royal, to pirates. With Spanish power waning and Frances’ power on the rise, the Treaty of Ryswick in 1697, included the acknowledgement by Spain of France's dominion over the Western third of the island, which is now the nation of Haiti. 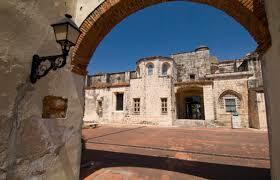 From 1795 to 1822 the city of San Domingo changed hands several times, along with the colony it headed. The city was ceded to France in 1795 after years of struggles, and it was briefly captured by Haitian rebels in 1801. France recovered it in 1802, and was once again reclaimed by Spain in 1809. In 1821 Santo Domingo became the capital of an independent nation after the Criollo bourgeois within the country, led by José Núñez de Cáceres, overthrew the Spanish crown. The nation was unified with Haiti just two months later. The city and the colony lost much of their Spanish-born peninsular population as a result of these events which caused a great deal of instability and unrest. 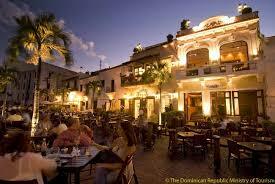 Today the city is not only the capital of the nation of the Dominican Republic, it is also a popular tourist attraction. The city has a rich cultural heritage, featuring theater and performing arts. The area is famous for its beaches, its February Carnival is legendary, and sports fans can enjoy world-class baseball. The Ciudad Colonial, as the old part of the city is known today, features a cathedral that dates form the 1500’s, a historic fort that has figured in much of the nation’s Spanish history, and the oldest paved street in the New World, built in 1502. The area also features historic restaurants. Last Episode of Black Sails.